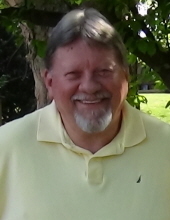 Mr. Jimmy Dale Miller, age 68 of North Wilkesboro, passed away Wednesday, November 28, 2018 at his home. Funeral services will be held 1:00 PM Friday, November 30, 2018 at Millers Creek Baptist Church with Rev. Shannon Critcher officiating. Burial will be in Mountlawn Memorial Park. The family will receive friends from 11:00 until 12:30 prior to the service at the church. Mr. Miller was born August 16, 1950 in Wilkes County to James Revere Miller and Betty Jean Woodie Miller. He was a retired Law Enforcement Officer. Mr. Miller was a member of Millers Creek Baptist Church. He was preceded in death by his father, and a brother; Jeffrey Miller. Mr. Miller is survived by his wife; Henrietta Jane Craven Miller of the home, his mother; Betty Jean Miller, two daughters; Angela Ellis and husband Greg of Millers Creek and Kendra Birch and husband Nathan of Wilkesboro, four sons; Brian Miller and wife Holly of Bristol, Va, Joshua Miller and wife Mandy of Greensboro, Achan Smith and wife Candie of Mocksville and Alfred Smith of Lumberton, thirteen grandchildren; Savannah Ellis Walsh and husband Ryan, Brent Miller, Shaunasee Briand, Chaselyn Ellis, Brandon Miller, Colton Briand, Zach Smith, Dawson Ellis, Eli Smith, Lillian Briand, Laney Miller, Jonah Miller and Laila Smith and two sisters; Debbie Minton and husband Jerry of Millers Creek and Crystal Stringfield of Asheville. To send flowers or a remembrance gift to the family of Jimmy Dale Miller, please visit our Tribute Store. "Email Address" would like to share the life celebration of Jimmy Dale Miller. Click on the "link" to go to share a favorite memory or leave a condolence message for the family.